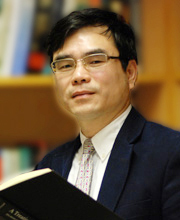 Prof. Zhang is currently Wei Lun Professor of Economics in the Department of Economics at The Chinese University of Hong Kong. Before returning to Hong Kong, he was Assistant Professor in the Department of Economics, University of Western Ontario. He is a Fellow of the Econometric Society. His research (both theoretical and empirical) has focused on the economics of family behaviour, including crime, fertility, marriage, education, intergenerational transfers, marital transfers, gender bias, and old-age support. He also works on family-related macro issues, such as ageing, social security, and economic growth. Using many data sets from different countries (regions), either micro or macro, he has studied economic issues in Canada, the US, the Philippines, Taiwan, Hong Kong, as well as the Chinese mainland.